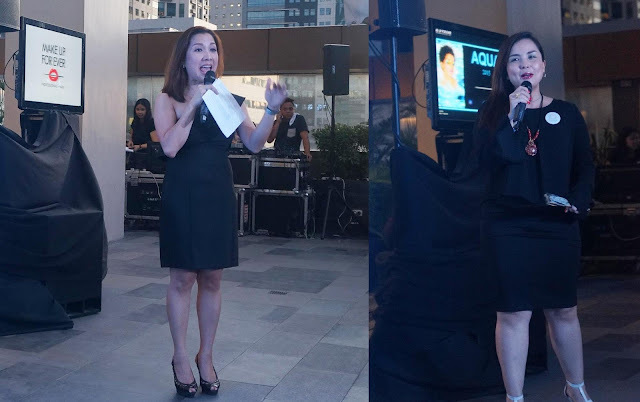 What to wear when you get an invite for a "Poolside" party at F1 Hotel for a brand that's known for waterproof make up products? Sunblock, lightweight clothing and a huge smile! That's me during the launch of Make Up For Ever New Aqua Collection. Just like me, I'm sure YOU are on a hunt for a really good, waterproof make up product and one of the brand I trust most even for my bridal clients is Make Up For Ever. Check out my favorite Aqua Eyes HERE. And I'm glad they came up with the NEW Aqua Collection. Just check out all the lovely shades! We watched live synchronize swimmers as they have Aqua Liner drawn all over their face and body! The colors literally stayed even when when! Lyra and Erika welcomed everyone with an excitement on this new line! For this summer look and ad, Danny drew inspiration from water and the color blue. Blue is Danny's favorite Aqua shade. Turquoise, electric blue mixed with touches of lime and pink made ad so unique and amazing! Started 2014 as part of Aqua range. 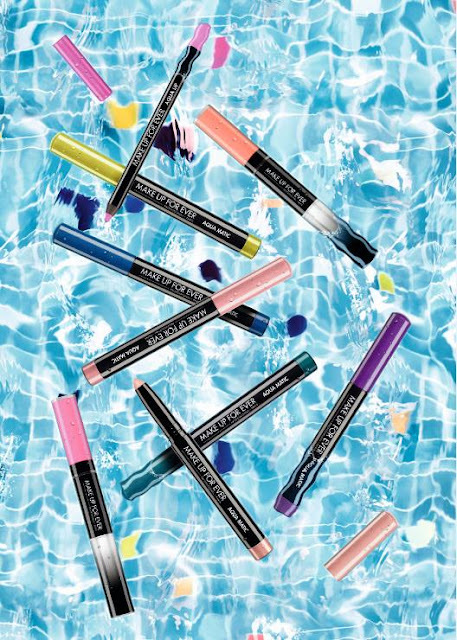 Aqua Matic has 10 shades to suit make up artists' need. This year, they have added 5 new shades! This line is perfect for women looking for extremely long-lasting lip product. There are originally 16 shades and they added 2 new shades for this collection. 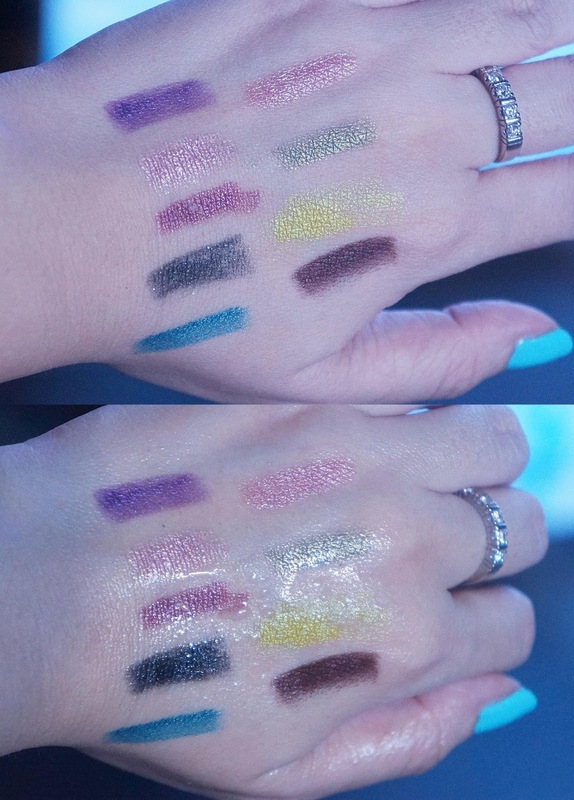 And to test how Sweat-proof and waterproof the Aqua Matic liners are, I swatched them at the back of my hand the moment I arrived the venue. An hour plus later, after all the sweating (the event was held outdoors) and I even had to spritz water, they stayed! I even had these marks when I drove back home and my son enjoyed seeing all these shades! With fellow Beauty Bloggers during the event. The New Aqua Collection will be available in Make Up For Ever stores at SM Megamall Fashion Hall, Greenbelt 3, Trinoma and SM MOA. Follow them on Facebook (makeupforeverph), Instagram (@Makeupforeverphilippines). I can't wait to share a review on the Aqua Matic and Aqua Rouge! Let me know which one would you like to read first! yup, super nice! one of the splurges I've done in the past I never felt bad about!